Toddlers can be extremely picky eaters. Thankfully our generation has this brilliant, what would we do without it, life hack, app called Pinterest. Pinterest is simply brilliant. If you aren't very creative *raises hand* you can find a ton of DIY projects that will make you look like a pro! I have found some amazing ideas on Pinterest that has helped me tackle my toddlers picky eater stage. You can find an ice cube tray at a Dollar Tree for a dollar. Who would've known this simple little thing that most of us have would come in handy for something other than ice? This idea gives you a variety of options to allow your toddler to choose and it is small portions so if they don't like it, it's not so wasteful! How cute is that? Fruit trays, momables (lunchables), veggies, nuts, meats, all types of foods. Seriously, why didn't I ever think of this before?! Kids love to dip things! My toddler loves dipping. I purchased cute little sauce cups and bowls for her to have with her meals. She'll dip anything. It's like food paint. She loves it! As we do not celebrate Halloween in my home, I would love to see what your little ones will be wearing for Halloween this year? 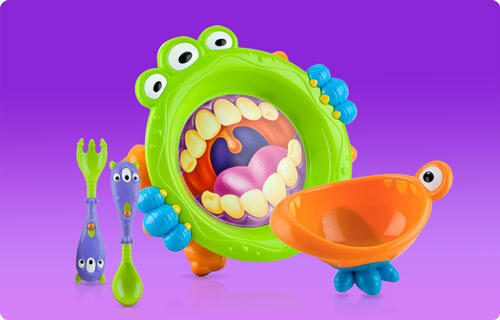 Share with me on Instagram @zobosmommy and you'll be entered to win an iMonster feeding set from Nuby! Comment your Instagram name below. Wonderful tips ! Thank you . I shared a picture of my twin grand daughters in costume on Instagram and tagged you in them :) I'm Avalashia on there and Twitter . Have a blessed day ! Great tips. Thank you :) Tagged a picture with #imonster2015 of my daughter. I love this set its so cute. @kcandck on IG. Thanks for the chance. I got you, you're entered!